This is a completely authentic capture which was captured during an official investigation with the East Tennessee Paranormal Research society. I have never seen any other capture like it. It was recorded in high definition, so it isn't like one of those low quality ones out there we see so often. On July 22nd of 2006 at around 11pm, I was on an official investigation with the East Tennessee Paranormal Research Society. I was talking with one of the employees of the theater who told me a story about a lady who had gotten trapped in one of the stalls and was unable to get out. The employee thought this may be a paranormal event, so I went to check it out and see if I could capture anything. I noticed when I got to that hallway with the bathroom there was a bit of an eerie feeling. I video taped around the restroom and asked questions trying to get EVPs on my audio recorder. I didn’t sense or see anything specifically in the restroom and left. After the investigation, after I had gone through my evidence (and gotten lots of great EVPs), and thought I was finished, I got a phone call late one night from my parents who told me I had captured a ghost on video. You see, they were also investigators, and were with me at the Bijou, and once we left there, we dropped by their house and my father made a copy of the video from my camera onto a DVD. Even though we had gone through it, he decided to go through it again in case we missed anything, and he saw this ghost skirting by the bottom of the frame. He gave me a time index, and I looked it up on my camera. Needless to say, we were all pretty shocked at what I seemed to have captured. We thought maybe it wasn’t what it seemed to be, and shared it with other investigators, but none of us could debunk it, it seems to be a ghost. Sean dudley, 37 has lived in the Knoxville, TN area most of his life. He has been interested in the paranormal ever since he had had his very first ghost experience at the tender age of 8 years old.
" I was getting ready to go into my dads office to get on his computer, and as I started to walk into the room, I saw just a white hand floating in the middle of the room." " At 8, I would have normally run off screaming, but I was literally so petrified, I could not move, which is a good thing in this case." "I saw the hand float across the room and physically pull a drawer out on my great grandfather’s desk." " At this point, I did manage to run off and got my dad. He came to the office, and sure enough, the drawer was now out when it had not been before." 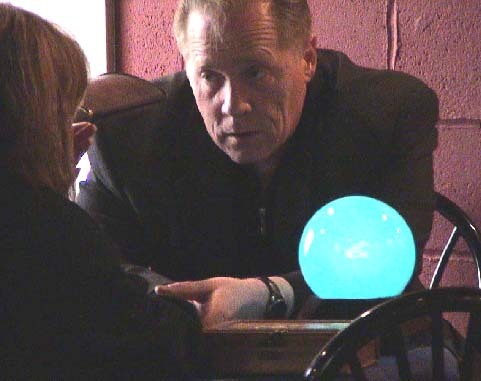 " I’ve had a number of other things happen through the years, so in 2006 I joined the East Tennessee Paranormal Research Society, and have gotten loads of EVPs and had a few personal experiences." "The paranormal fascinates me."